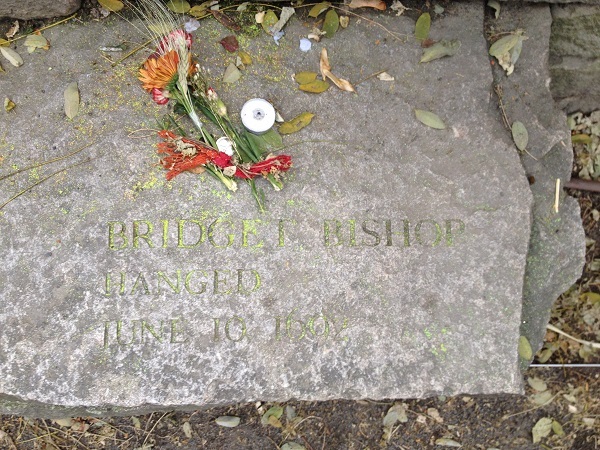 Bridget Bishop was the first victim to be hanged during the Salem Witch Trials of 1692. Bishop, whose maiden name was Playfer, was born sometime between 1632 and 1635 in England. In 1660, she married her first husband, Samuel Wasselby, in England and moved to the Massachusetts Bay Colony around the same time. After Wasselby died in 1664, Bridget married her second husband in 1666, a widower named Thomas Oliver who already had children from his previous marriage. Bridget and Thomas Oliver had one child together, a daughter named Christian who was born in Salem on May 8, 1667. Bridget and Thomas Oliver were fined and ordered to be whipped if they did not pay their fine on time. After Oliver died of an illness in 1679, Bridget inherited his estate, which consisted of a house worth £45, ten acres of land worth £25, a variety of household goods and two pigs. Oliver’s two sons and the couple’s daughter only received twenty shillings each. Just three months after receiving her inheritance in November, Bridget’s stepchildren accused her of bewitching Oliver to death. A lack of evidence prevented the case from going to trial and it was speculated that the stepchildren’s accusation was an attempt to get their hands on the property she inherited from their father. In 1687, Bridget was then accused of stealing brass from a local mill by the mill owner, Thomas Stacy, and arrested. Bridget claimed she didn’t steal the brass, but found it on her property and had no idea how it got there. She also stated that she sent her daughter into town with the brass to discover what it was, not to sell it, as Thomas Stacy accused her of doing. Unfortunately, there are no surviving records indicating the outcome of this trial. Since Bridget and Sarah Bishop were both accused of witchcraft and were both married to men named Edward Bishop, it’s easy to see how the two became mixed up over time. 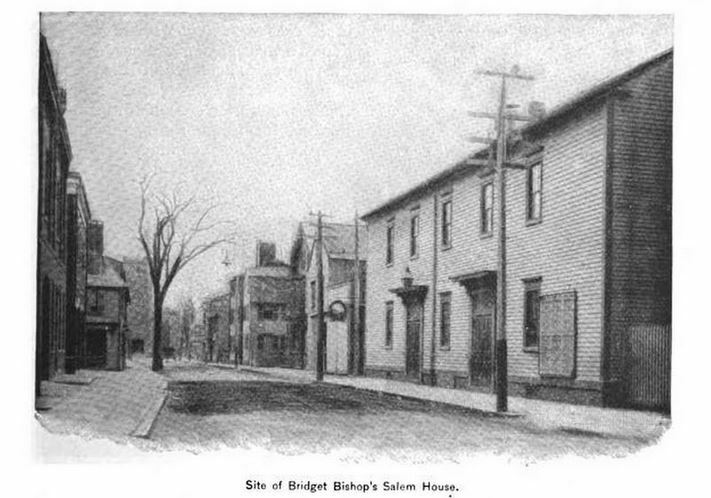 What historians do know about Bridget Bishop is that around the time of the Salem Witch Trials, she lived in what is now downtown Salem. She owned an apple orchard, which was located at what is now 43 Church Street (where the Salem Lyceum Society building was later built), where she also kept chickens. Bishop also lived in a house somewhere near the orchard, according to court records. Bridget Bishop was arrested on charges of witchcraft on April 18, 1692, after she was accused by Mercy Lewis, Abigail Williams, Elizabeth Hubbard and Ann Putnam, Jr.
“[Hathorne]: They say you bewitcht your first husband to death. [Bishop]: If it please your worship I know nothing of it. She shake her head & the afflicted were tortured. Sam: Braybrook affirmed that she told him to day that she had been accounted a witch these 10 years, but she was no witch, the Devil cannot hurt her. [Bishop]: I am no witch. [Bishop]: I have no familiarity with the devil. [Hathorne]: How is it then, that your appearance doth hurt these? body, which seems to have influence upon the afflicted? [Hathorne]: How do you know then that you are not a witch? [Bishop]: I do not know what you say. [Bishop]: I am clear: if I were any such person you should know it. [Hathorne]: You may threaten, but you can do no more than you are permitted. That same day, Bridget Bishop was indicted and arraigned on five separate charges of witchcraft. The amount of evidence against Bishop was overwhelming. 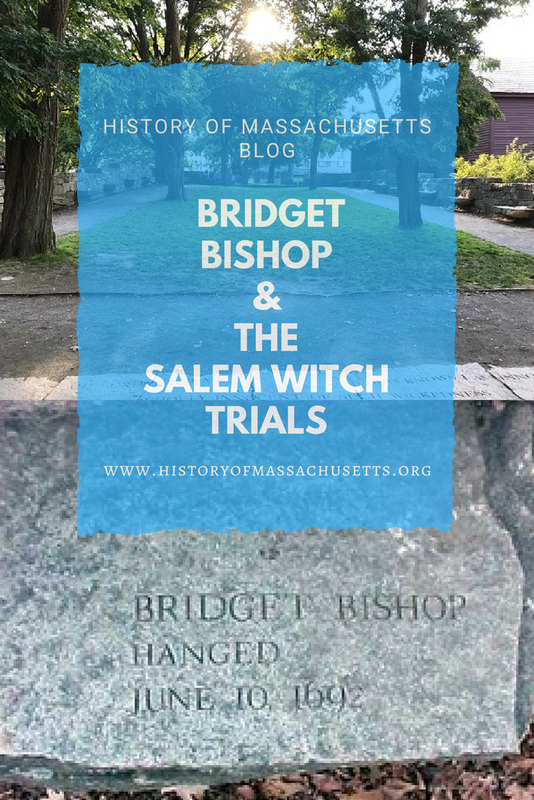 Over the course of the next few months, over 10 witnesses gave long, detailed testimonies about how Bridget Bishop bewitched them, their family and/or their animals. Once such witness was John Louder who testified that eight years before, when he was staying with Bridget Bishop’s neighbor, John Gedney, Gedney would often quarrel with Bishop about letting her chickens wandering into his apple orchard. Louder claimed to see the monkey on another occasion flying in the apple orchard and said he knew that it was real because it knocked apples off the trees as it flew over them. One of the afflicted girls, Susannah Sheldon also testified that she saw the spirit of Thomas Green’s twin boys who told her that Bridget Bishop had bewitched them to death. She also said Bridget Bishop’s spirit told her she had killed four women, two of them were “the Foster’s wives,” one was John Trask’s wife and she didn’t name the other. Two other witnesses, Samuel and Sarah Shuttuck gave a long, rambling testimony about how Bridget Bishop first asked them to dye a small piece of lace that they believed couldn’t be used for anything other than a poppet (a type of doll used in witchcraft), then bewitched their eldest child and physically attacked the child in person when she was confronted about bewitching him. The women were all examined again about six hours later, after which the examiners reported that Bridget Bishop and Elizabeth Proctor were clear of any mark and that as far as the other women were concerned, the unusual bit of flesh only appeared to be dry skin. The jury found Bridget Bishop guilty of witchcraft and issued her death warrant on June 8, 1692. On Friday, June 10, 1692, sometime between 8am and noon, Bridget Bishop was taken to the execution site at Proctor’s Ledge in Salem and hanged. 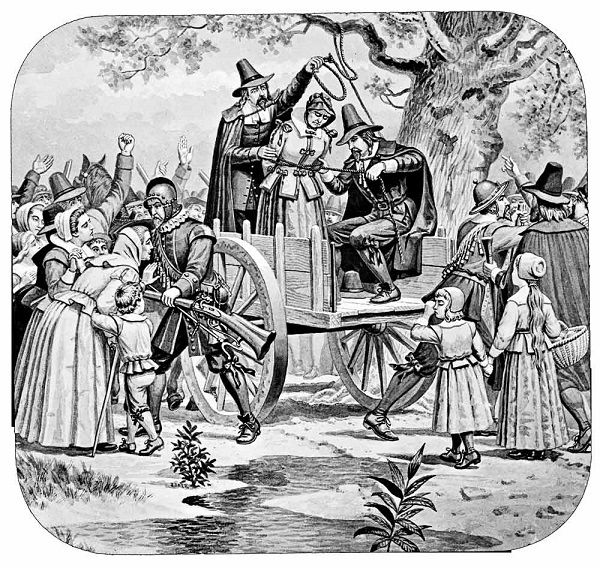 Bridget Bishop was not the first victim accused during the Salem Witch Trials of 1692, but it is believed that officials chose to hear her case first because they felt, given her prior history and reputation, it would be an easy win. They were right and a string of other convictions and executions followed hers before the hysteria came to an end in 1693. In 1711, the Massachusetts legislature passed a bill clearing the names of some of the accused and granted restitution to their families. Bishop’s family, and several others, did not come forward to accept the restitution nor to be named in the bill and, therefore, their names were not cleared. In 1957, the Massachusetts legislature officially apologized for the Salem Witch Trials and cleared the names of “One Ann Pudeator and certain other persons” but failed to mention the remaining victims by name. In 1992, the Salem Witch Trials Memorial was built in Salem, Mass and a marker was established for Bridget Bishop. In 2001, the Massachusetts Legislature amended the 1957 apology and finally cleared the names of the remaining victims: Bridget Bishop, Susannah Martin, Alice Parker, Wilmot Redd and Margaret Scott. 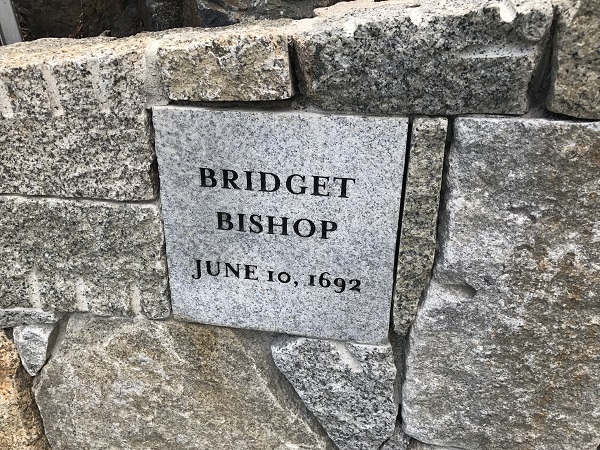 In 2017, the Proctor’s Ledge Memorial was built in Salem, Mass and a marker was established for Bridget Bishop. Essex Institute Historical Collections, Volume 2. Henry Whipple & Son, 1860. Boyer, Paul S. and Stephen Nissenabaum. Salem-village Witchcraft: A Documentary Record of Local Conflict in Colonial New England. Northeastern University Press, 1972. Upham, Charles W. Salem Witchcraft: With an Account of Salem Village. Wiggin & Lunt, 1867. Gibson, Marion. Witchcraft and Society in England and America, 1550-1750. Continuum, 2003. Mudgel, Zachariah Atwell. Witch Hill: A History of Salem Witchcraft. Carltan & Lanahan, 1870. Hearn, Daniel Allen. Legal Executions in New England: A Comprehensive Reference, 1623-1960. McFarland, Incorporated Publishers, 2007. Goss, K. David. The Salem Witch Trials: A Reference Guide. Greenwood Press, 2008. I just read your post of October 10, 2011 on Bridget Bishop. Thanks for posting this well-researched and documented article. I’m a descendant of Edward Bishop and Sarah Wildes of Salem Village. I’ve been researching these Bishop’s, mostly from on-line sources – but also from some microfilmed records rented from the FHL in Salt Lake City. I’ve searched deeds, tax records, court records and every other kind of record I can find and had reached the same conclusions you present in your post regarding the mis-identifying of both Bridget Bishop with Sarah Bishop and of Edward Bishop (the sawyer) with one or more of the Edward Bishop’s in Salem Village. The deeds and tax records have been very helpful in sorting out this confusion. Looking at deeds in which any Edward Bishop was a grantor in Salem (town or village) has been the most probative. Edward Bishop (c. 1620-1695) of Salem Village used a mark “EB” to sign off on his deeds. Edward Bishop (1648-1711) signed with his full name and his wife Sarah signed with her mark. Edward Bishop (c. 1670-1747) also signed with his full name, with his wife Susannah using a distinguishing ‘mark’. None of them used an “X” or a cross as a mark. However, Edward Bishop, the sawyer, of the town of Salem – did use an “X” as his mark on two 1694 documents regarding property and guardianship moneys. I’m trying to get a copy of David L. Greene’s article on Bridget Bishop. I can get a copy through the collection of periodicals held at Allen County Library in Fort Wayne, Indiana; but I’m looking for some source where I could get it more quickly. They state that it can take 6 weeks to get copies from their collection. Any ideas where I could access this article? Thanks again for your excellent article and I definitely will follow your blog now that I’ve found it! Thank you for your comment, Nora. I’m really into genealogy so I love hearing from descendants of the Salem Witch Trial victims. I too wish I could get a copy of David L. Greene’s article. I’ve been scouring the web looking for it since I started doing research for this article and haven’t been able to find it anywhere online yet. Sorry I couldn’t be more help. Rebecca, I was just reviewing these comments we share in 2015 regarding the article by Dr. David L. Greene. I was able to get a copy of the article later through my membership at the New England Historic Genealogy Society. Their on-line collection includes many of the genealogical journals, and that’s where I found the article. It’s title is, “Salem Witches I: Bridget Bishop”; and it’s in THE AMERICAN GENEALOGIST, vol. 57, (1981), pages 129-138. If you’re unable to get a copy, I can see if I can email it to you. It’s about 9 pages long. Thanks Devin! Happy to help! Thanks this helped me a lot with my school project! May I please have the source of the illustration for the hanging of Bridget Bishop? Thank you. It’s actually one of the only illustrations that I haven’t be able to find a source for. Hello again, Rebecca. Nice to see this posted again in remembrance of Bridget Bishop and want to thank you again for untangling the confusion about Bridget and Sarah Bishop. The one thing I want to submit here is that the husband of Sarah Bishop was not Bridget’s stepson. The Edward Bishop Jr who married Sarah Wilds was the son of Edward Bishop, Sr and his wife Hannah. And Hannah was still living in 1692, evidenced by the fact that she signed the 1692 petition (as did her husband Edward) in behalf of accused witch Rebecca Nurse. Therefore, Bridget’s third husband was a different Edward Bishop, the one who was a sawyer and lived in Salem Town, whereas Sarah and her husband lived in Salem Village. There were 3 generations of Bishop’s residing in Salem Village in the year 1692, each having a male named Edward. They could be identified by how they signed off on deeds, along with the names of their wives. Edward Sr signed using his initials, EB. Edward Jr and Edward 3rd both signed their whole names. Only Edward Bishop, sawyer, of Salem Town signed using an “X”, which he used for signing a document regarding dispersal of some of Bridget’s money to her heir. With four men of the same name living in this area at one time, and two women with the same last name both being accused of witchcraft, it’s no wonder there’s been so much confusion about these unfortunate people through the years!